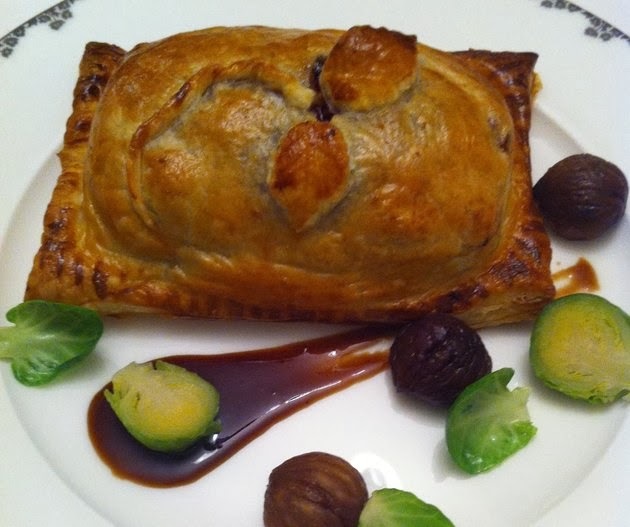 Christmas Day doesn't have to be a stressful affair, here is a contemporary reinvention of the Classic, that is achievable at home, with a degree of minimum effort, that will still bring the wow factor to your table. While keeping it simple , it is very tasty and easy to do. Not great heaped servings and an overload of luxury, but a spoonful or two of festive tastes, with flavours intense and complimentary. Lighter and done afresh, the most basic recipe can be topped and dressed, in shape or form, to look fabulous by the most inexperienced cook and as long as you use quality ingredients, they will taste fantastic too. Here; Dinner is served on smart white china with crisp pressed napkins and champagne, not mulled wine is the drink of choice. Inexpensive too and most ingredients are from Lidl ... Ireland. 8 x vacuum packed cooked Chestnuts,finely chopped. Place the ham in a big pot of cold water, bring to the boil,discard the water and start again, and this time add the chopped vegetables. . Bring to the boil and simmer for 1.5 hrs. Blend the maple syrup, treacle and mustard. 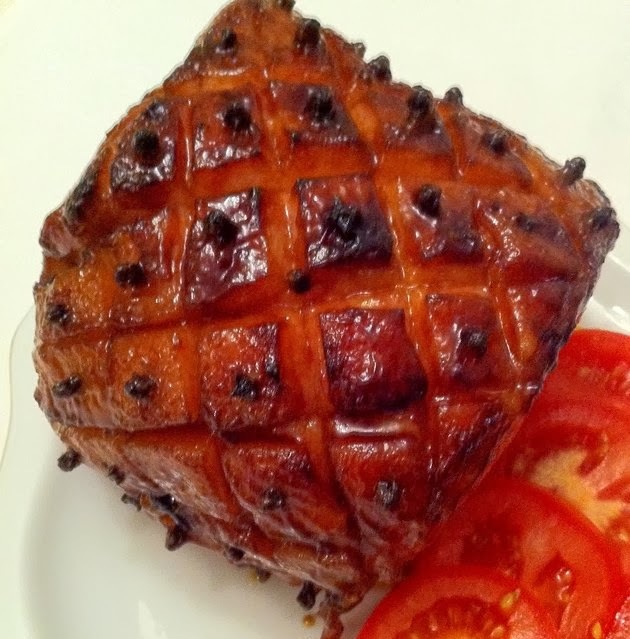 Peel off the outer thick skin of the ham,leaving a good layer of fat still on, make cuts in the fat in a x cross pattern and insert a clove in each. Brush with the glaze and bake in the oven for 20 – 30 mins until mahogany coloured and dry. Transfer to a serving dish and rest for 20 mins before carving. Sautée the shallot with the butter and oil until crisp and golden. Add the streaky bacon or finely chopped ham off cuts. Add the finely chopped chestnuts , season with salt & blk pepper and add in the sage & onion stuffing. 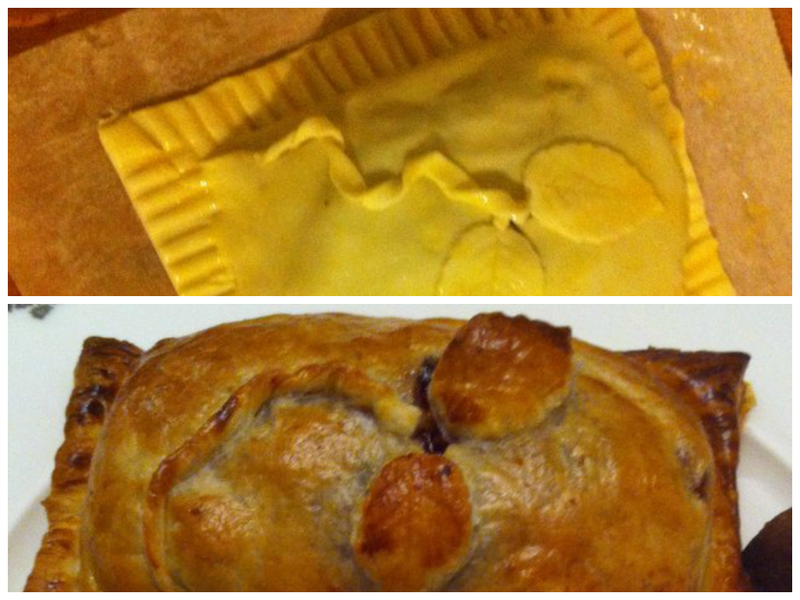 Unroll your pastry and cut into 4 squares. Place a turkey fillet on and top with a generous serving of the stuffing mix. 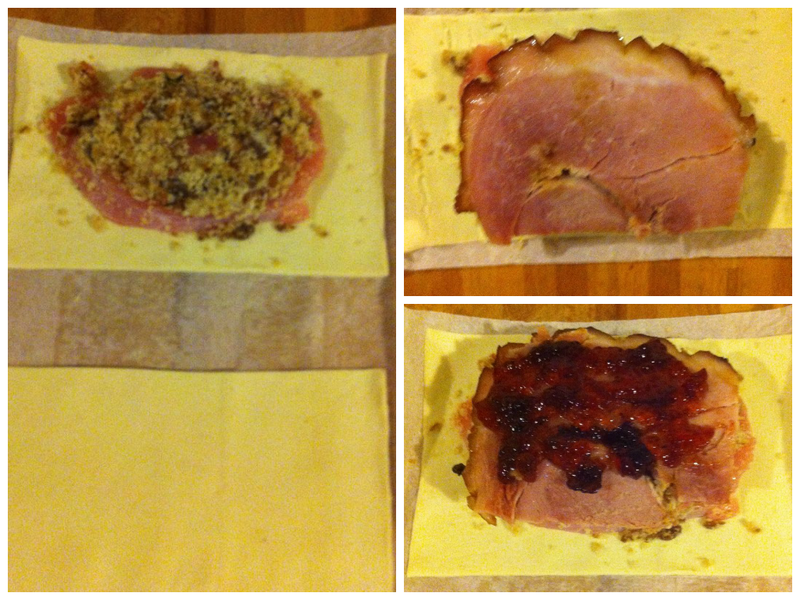 Next , place a slice of the cooked ham on top and spread with the Cranberry sauce. Brush all sides with egg wash.
Bring the wine & port to a boil and reduce by half. Add the Chicken stock and reduce once more until thickened . Add the cranberry jelly to obtain a shiny glaze. 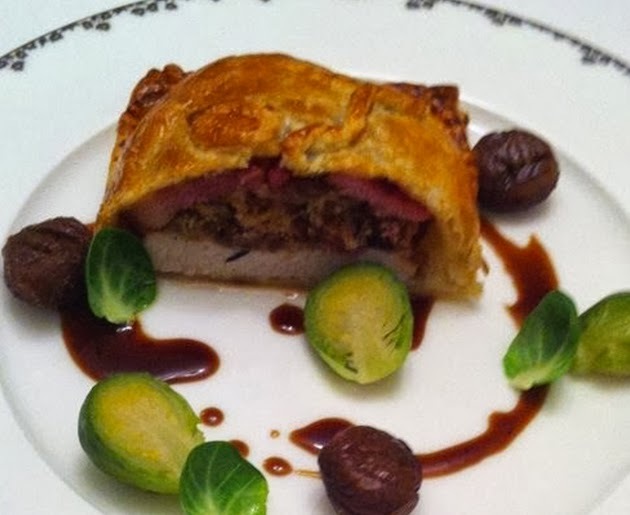 Serve with steamed brussel sprouts & whole chestnuts.